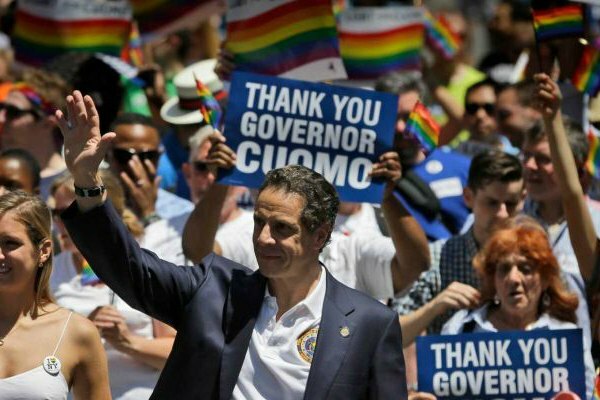 New York Governor Andrew Cuomo has signed an executive order that prohibits state entities from doing business with any company that promotes or tolerates discrimination. Cuomo announced the order at Saturday's Human Rights Campaign (HRC) Greater New York Gala, where he also promised New York would lead the nation on ending the AIDS epidemic and announced plans to introduce legislation this session that would put an end to the so-called gay panic defense. The Democrat said that his order was a direct response to President Donald Trump's policies. “The Trump administration gave the attorney general a license to discriminate by interpreting 'religious liberty' protections in the federal law. What that means is a business can refuse to serve LGBTQ individuals because it violates their religious beliefs. They did that. So, today I'm signing an executive order prohibiting New York state government from doing any business with any entity that discriminates against any New Yorker, period,” Cuomo said at Saturday's event.